So far the UAE has weathered the global oil price slump relatively well, supported by its increasingly diversified economy and ample foreign assets. Domestic politics are influenced considerably by the ruling families and traditional tribal structures. Political parties or trade unions are not permitted and opposition is virtually non-existent. The Federal National Council (FNC) as a legislative body has only an advisory role. The UAE will maintain an assertive foreign policy in order to increase its regional influence in light of continued insecurity in the Middle East. The country is part of the alliance against the Islamic State (IS), and as such it has launched air strikes against IS in Syria and Libya. At the same time, its armed forces are part of the Saudi-led campaign against Houthi rebels in Yemen. 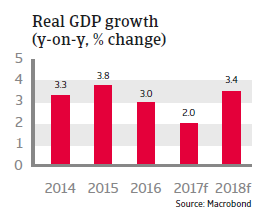 The UAE has weathered the global oil price slump relatively well, supported by its increasingly diversified economy, a stable political environment and ample foreign assets. However, in 2016 economic growth slowed down to 3.0%, amid declining liquidity in the banking sector and weaker business sentiment. 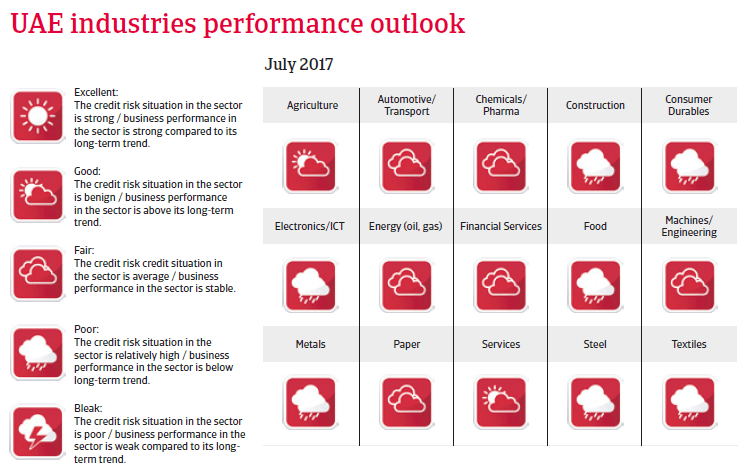 Since Q4 of 2015 many businesses in the IT, consumer durables, food, metals, steel and construction sectors have faced increasing troubles. Commodity price volatility (especially steel, metals, food commodities) in 2015 and 2016 has negatively impacted various traders and distributors, who had to face liquidity/cash flow issues and have either delayed payments to suppliers or, in some cases, just shut down their businesses. With the gradual recovery of the oil price in the course of 2016 economic confidence and appetite for investment projects have gradually improved again, especially in the transport, tourism and construction sectors. Increased infrastructure spending in the run-up to the World Expo 2020 event hosted in Dubai should additionally stimulate economic activity. However, the situation will remain difficult in 2017 for the troubled sectors mentioned above, as domestic bank lending conditions remain tight, and 2017 GDP growth is likely to be affected by the UAE’s commitment to cut oil production in line with an November 2016 OPEC agreement. At last, a 3.4% rebound in GDP growth is expected in 2018. 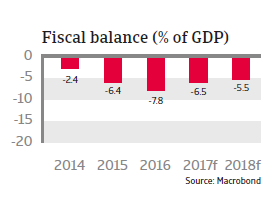 The budget deficit is expected to decrease to around 6.5% in 2017, due to cuts in public spending/subsidies and the modest oil price recovery. The focus remains on shifting towards raising non-oil revenues (e.g. the planned introduction of a value-added tax of 5% in January 2018). At the same time, some easing of austerity is on-going with increasing social support (in order to stem any discontent after previous subsidy cuts) and the stepping up of new development projects. 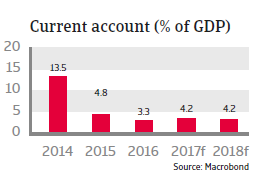 The current account surplus shrank from 13.5% of GDP in 2014 to less than 4% in 2016, and is expected to recover only gradually amid still low oil prices. Maintaining the currency peg of the dirham to the strong USD could hamper competitiveness of non-oil sectors and hinder diversification efforts (the real effective exchange rate has appreciated by about 20% since mid-2014). 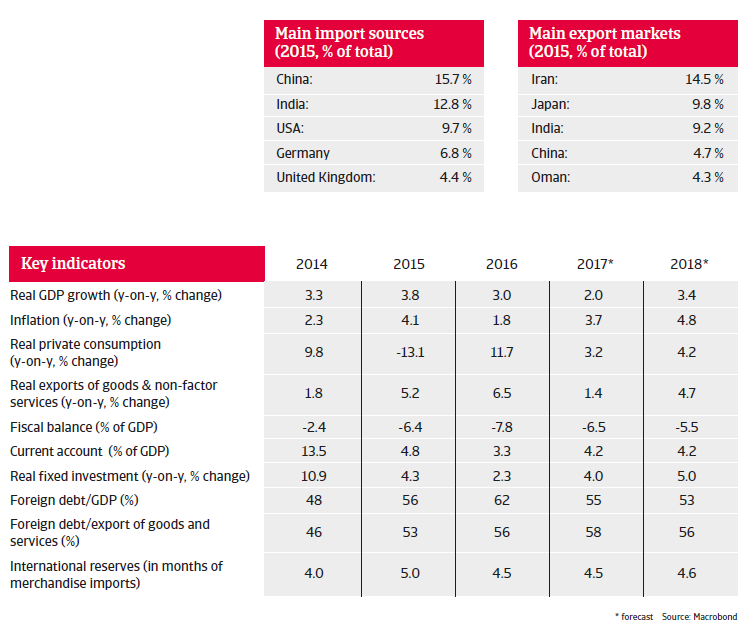 However, there is little risk of the dirham being de-pegged, as large foreign currency assets provide strong support. Despite progress in debt restructuring on part of government related entities, a high gross external debt level of USD 235 billion (62% of GDP) remains (a legacy from the property market crisis in 2008/2009). Although weak domestic liquidity and higher US interest rates have increased short-term roll-over risks, the UAE has more than sufficient reserves to cover the substantial financing needs. In addition, it can fall back on large Sovereign Wealth Funds, which have an estimated total value of over USD 1.2 trillion. Moreover, the federal authorities are preparing legislation that will enable them to access international capital markets; a right that is currently reserved for individual emirates only. Currently non-oil sectors account for 70% of the UAE´s total GDP, and the government´s strategy is to further diversify the economy away from oil in order to ultimately establish a knowledge-driven economy in the long-term. There is still scope for further cementing UAE’s role as commercial hub, for example by relaxing constraints on foreign direct investment and easing access to finance for small and medium-sized enterprises. The introduction of a long-awaited bankruptcy law end of 2016, which facilitates the debt restructuring process, is considered to be a step in the right direction.